The DCU student produced another excellent run in Rio. FOR A LARGE part of this T13 1500m Paralympic final, Ireland’s Greta Streimikyte had positioned herself to make a charge for bronze but even a lifetime best wasn’t quite enough to secure a podium finish. The 21-year-old shaved four seconds off her personal best but was forced to settle for fifth, which was later upgraded to fourth, in a race dominated by two Tunisian athletes, who set an incredibly quick pace from the off. 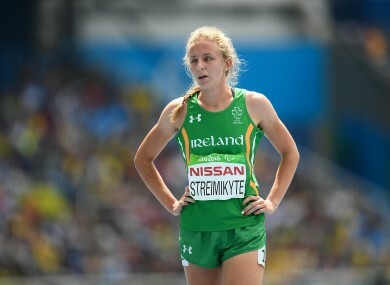 Streimikyte, who moved to Dublin from Lithuania five years ago, crossed in a time of 4:45.06 but was bumped up a place after the race when officials disqualified Mexico’s Daniela Maldonado. “To be honest I’m still a little bit in shock because it was a fast race,” she said in the mixed zone. World champion Somaya Bousaid stormed to gold as her team-mate, Najah Chouaya, took silver. The pair came out of the blocks quickly and stormed ahead of the field as two races within the final developed. Streimikyte was very much in contention for the bronze until the final bend, at which point she had run of out steam after three punishing laps. “The fast start kind of ruined my tactics but I was thinking after the first run on Thursday that you’re kind of dragging girls but it happened different and the girls dragged me,” she the Clonliffe Harriers athlete continued. “My idea was to push the girls but they went really fast and I had to actually keep up with them and it was a change of plan but it was a championship race, you just never know. You can have these plans but you just never know. Email “A performance to be proud of as Greta Streimikyte shaves 4 seconds off lifetime best ”. Feedback on “A performance to be proud of as Greta Streimikyte shaves 4 seconds off lifetime best ”.